Let's talk about walls. We might as well. It seems all the rage these days. Grown men and women fighting over why, whether, when and where, how high and how much. 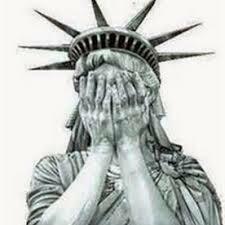 All this while thousands of their own suffer new affronts and the huddled masses yearning to breathe free simply huddle, hungry and short of breath. Let's talk about walls, like the one in China. Built and rebuilt over centuries, it houses many of it's builders. When Emperor Qin Shi Huang ordered the construction in 221 B.C., the labor force was mostly soldiers and convicts. As many as 400,000 died in the effort and their bones are part of the barrier. At different points in history the wall was breached, rebuilt, extended to as far as 13,000 miles. 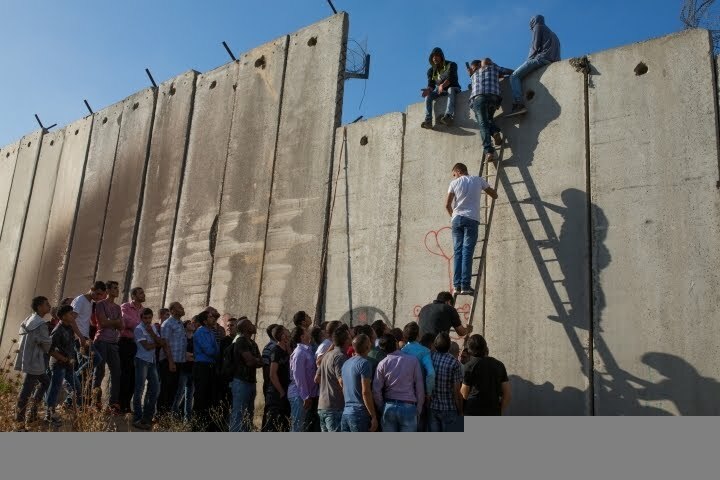 At one point the same peoples were occupying the land on both sides of the wall. 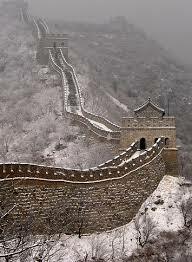 Now, of course, The Great Wall of China is primarily a tourist attraction, as we live in an age where people can fly. Or let's talk about the Berlin Wall. 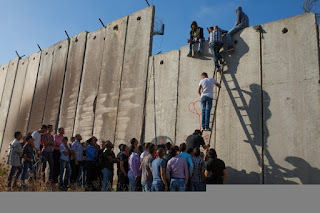 An affront to human decency and democracy, this wall lasted from 1961 to 1989. The wall was built by East Germany to protect their population from "fascist" elements from the West, who were bent on destroying the will of the East German people to build a socialist state. The official name was the Anti-Fascist Protection Rampart, in German, Antifaschistischer Schutzwall. This wall was a concrete barrier with a death strip, a no man's land, where many fleeing the East for freedom lost their lives. 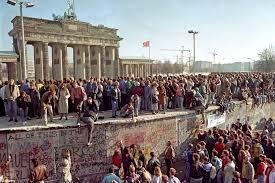 West Germans called it the Wall of Shame and it came to symbolize the "Iron Curtain" of the Cold War. It walled people in as much or more than it walled others out. The pictures are still in my memory of the celebration and joy as the wall was torn down, piece by piece, by reunited families and a reunited country. 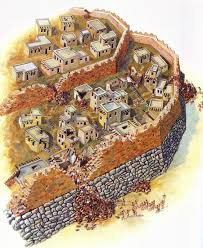 Or what about the walls of Jericho? I love that story! It demonstrates the problem with walls. Once you wall others out, you also wall yourself in! "Now Jericho was shut up from within and from without because of the people of Israel; none went out and none came in." It also demonstrates the fragility of walls. Walk around them seven times, blowing the trumpets on the last pass and they will tumble of their own accord. Watching the story of Jericho on Veggie Tales, my young son was always fascinated when the wall fell. He would want to play that scene over and over again. I'm certain he must have learned the secret of felling a wall, he watched that scene so many times. Then I think of Robert Frost and his poem "Mending Wall," "Something there is that doesn't love a wall." It's not just the weather that eventually fells the stones, but it's the hunters wanting to out the rabbits for their dogs. And although Frost's neighbor is convinced "good fences make good neighbors," Frost is not convinced. Maybe if there were cows. But his apple trees are not going to eat his neighbor's pines. "I see him there bringing a stone grasped firmly by the top in each hand, like an old time savage armed. He moves in darkness as it seems to me, not of woods only and the shade of trees. 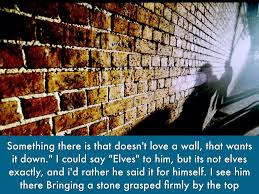 Before I built a wall I'd ask to know what I was walling in or walling out, and to whom I was like to give offense." 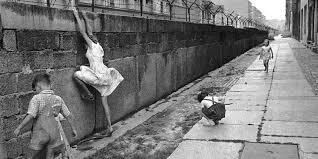 As the debate in our country continues and millions suffer from lack of resolution, we might consider the history and lessons of walls. What is their intention and what is the emotional and political freight they carry? For Christians who take the Bible seriously, they might consider all of the references to welcoming the stranger in Scripture. And since so much of the emotional energy for building walls is fear, they might consider the passages in first John like, "There is no fear in love, for perfect love casts out fear." Emperors and autocrats will always want to build walls, to wall their subjects in and their enemies out. It's as true of an autocratic and judgmental God as it is of the human kind. But for me, "there's something that doesn't love a wall." One could simply be rational and recognize that these days, we can climb and tunnel, and we can fly, like the Army Special Forces guy who brought 70 pounds of cocaine into the country on a troop transport. Or, in a more positive frame of mind, perhaps that something that doesn't love a wall is love of neighbor. Or perhaps it's fundamentally a love of freedom.